The Contact Group sees itself as an interface between the LGBT-subcultures of Munich and Kyiv and other cities in Ukraine; we initiate, moderate, coordinate and carry out projects on our own or in cooperation with the large groups and associations of respective communities. We stand by their side at any time. In Munich, these organizations are currently LeTRa (Lesbian women), Münchner Aids-Hilfe, Rosa Liste (Pink Party) and Sub (Gay Community Center), shareholders of CSD München, Munich Pride. Also cooperate groups like Aufklärungsprojekt Munich (schools), Daneben (Subculture for women and transgender), Diversity (LGBT-youth), Forum Homosexualität (History of LGBT-movement), Gay Outdoor Club GOC, Gay & Gray, InsideOut Munich (Tennis Club) and Isarhechte (Gay Swimmers). We welcome the lesbian choirs Lilamunde and Melodiva, the mid-age lesbian group MiLes, Münchner Löwen Club MLC (Fetish), Philhomoniker (Gay Choir), the LGBT-choir Regenbogenchor, Team München (Sports Club), TransMann (Transgender) as well as Queeramnesty, QueerCampus (Students), the members of Queergottesdienst (Church), Queerelations (Film network) and VelsPol Bayern (Lesbian, Gay, Bisexual and Transgender policewomen and policemen in Bavaria). We are many! In Kyiv, entities involved are Fulcrum (Gay and bisexual men: Advocacy, HIV-prevention), Alliance.Global (Gay and bisexual men: Community Center, HIV-prevention, Counselling), Gay Alliance Ukraine (LGBT: Community Building, Mobilisation, Advocacy, Public Awareness) and its Queer Homes, Gay Forum Ukraine (LGBT: Mobilization, Advocacy, PR), Insight (Lesbian women, Transgender: Community Center, Research, Advocacy), Nash Mir (LGBT: Advocacy, Research, Trainings, Human Rights’ Case-Management) and the parents’ initiative Tergo. Also Munich keeps in touch and works with Liga (LGBT: Mobilization, Health Issues, Counselling, Advocacy, PR) in Nikolaev. The CSD München and the KyivPride organizations have created their own cooperation. Munich Kyiv Queer joins their projects and actions whenever possible. In our Contact Group are people, women and men, of all ages from the LGBT-Scene in Munich and Kiev. We come from different backgrounds and bring our individual life and work experiences with us. Everyone is welcome, everyone can make a contribution. Munich Kyiv Queer meets every third Tuesday of the month, we have a core team and people who work with us from time to time. Wieland is a doctor and he loves his job. His clients know that he is gay. “I’m out and people accept who I am”, he says. It has not always been like that. Wieland came out late as he was very afraid to live openly as a gay man. It was Munich’s LGBT-community, such as Gay Outdoor Club and the city’s gay community centre Sub that gave him the confidence to come out of the closet. He has done a lot for the community since then. When he was board member of Gay Outdoor Club, he made it part of the German Alpenverein which is very conservative. With his husband Uwe he, additionally, founded Munich’s Rainbow Foundation. He wants to give something back. That’s why he came to join Munich Kyiv Queer. Wieland is a caring man, but also tries to make Munich Kyiv Queer work effectively. He is actually good in solving conflicts. 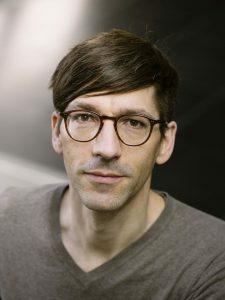 He has been responsible in Munich’s Gay Community Center Sub for working with the press for several years, recently he joined Munich Pride to take care of its PR. Conrad didn’t know much about Ukraine until the summer of 2012. After he met three guests of Munich’s CSD from Kyiv during the Pride Week to talk about press work on both sides of the Schengen-border, he began to become interested in the lifes of lesbians, gays and transgender there and now he is all fired up on the issue. Conrad organizes the Contact Group and its press work; his husband also co-ordinates the Pride partnership between CSD Munich and KyivPride. His main job is as an independent journalist and editor. Of course, Uwe has many duties already. Most time in a week he works for Siemens to earn a living. “And I am working hard to gain some honour working for Munich’s gay community centre Sub, too”, he says jokingly. Uwe is a volunteer. Both jobs are fun for him and give his life a meaning. Uwe is a big lover of human beings. He supports people and gives advice if they might feel they need it. After having given company to his husband Wieland for KyivPride 2013, he now is part of Munich Kyiv Queer. Currently, he’s developing volunteer trainings for Kyiv’s LGBT-community every year and visits OdesaPride nearly every year. 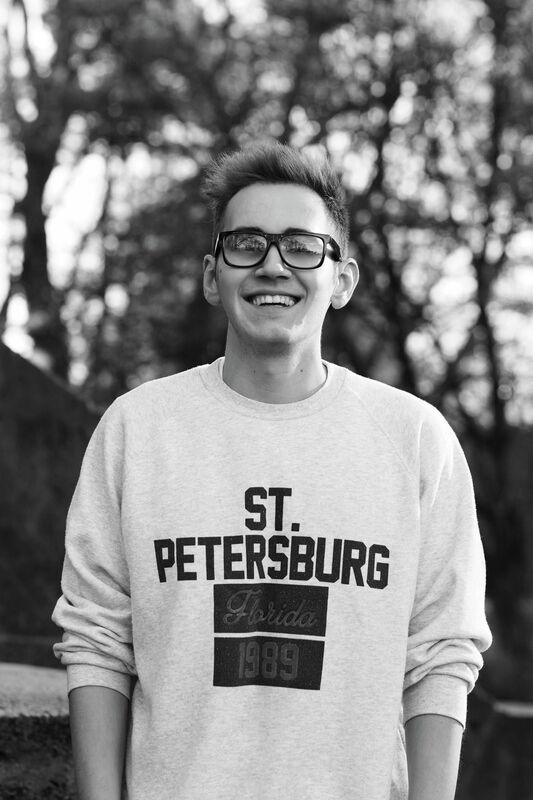 He is one of Munich Kyiv Queer’s speakers. Swimming has long been a passion for Thomas. Therefore it didn’t take long after moving to Munich in 2008 to jump in with the Isarhechte. The Isarhechte are a lesbian and gay swimming club and without them Thomas wouldn’t have found friends so quickly in a strange city. It showed him how important it is to have a functioning LGBT scene. Now working in international trade, he always had an interest in things eastern, even from childhood as he grew up on the former inner-German border with a view of the Iron Curtain. This sharpened his desire for freedom and justice. He has responsibility for “Kyiv issues” within his sport club. Katja is the good soul of Munich Kyiv Queer. Born in Ukraine, she has lived in Munich for many years, Katja studied here and most recently worked at the university. She has observed Munich Kyiv Queer’s work as part of the large Ukrainian community in the city for a very long time and then decided to get involved herself. With her ideas, her contacts and her commitment she is a great enrichment for the group. She joined with all her heart, nothing is more repugnant to her than when people are treated unfairly. 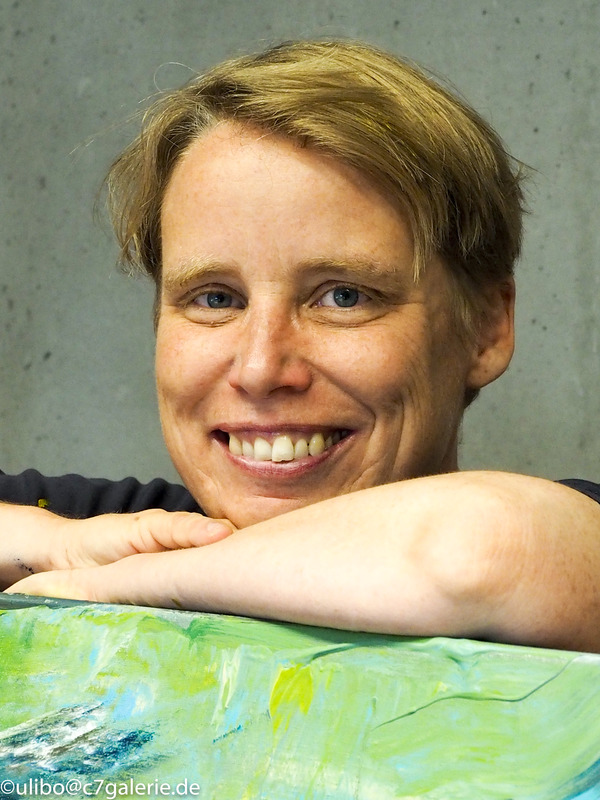 Naomi ist easily one of Munich’s most famous artists that gets involved for the LGBT -community of her home city. Her works can be seen in many cafés and institutions of the scene, just recently a sculpture from Naomi was unveiled in the Munich City Museum. Naomi wants to engage herself for Kyiv, it is something close to her. Naomi bubbles with ideas. For CSD in Munich, she already created eye-catching art, she regularly exhibitits her work in Ukraine and holds workshops about “Creative Protest”, even a festival in Odesa. It is sometimes frustrating. 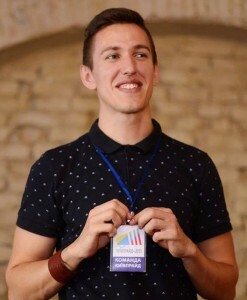 For years the young activist Stas has been involved in the campaign for rights for lesbians, gays and transexuals in his home country. The scene is, thanks partly to him, more visible, louder, more authoritive. All of Europe gives its support. The community is more of a threat than before though and almost nothing is moving forward at a state level for the sexual minorities in the country. Stas worked for many years for Gay Alliance Ukraine, edited the gay magazine Stonewall and recently finished as fundraiser for the Regional HIV Legal Network that delivers legal support for people who are HIV-positive or somehow affected. He is also part of KyivPride though ne now lives in Munich with his husband Conrad. In his spare time, he works as a photographer, musician and designer – he’s good in so many things. has lived and worked in Munich for many years. From a distance, he wants to support the LGBT-community in his home country. Oleksii does this with commitment and in silence. With Conrad, for example, he takes care of our website, but he is also always present at projects and activities when we need help. And that matters, because Oleksii is very busy professionally. So young, so dedicated. Kamil can quickly get enthusiastic about something when he’s touched. He has been interested in the LGBT movement in Eastern Europe for years, especially in Ukraine. Kamil himself comes from Russia and knows what it means to be excluded as a member of a minority. He loves his country and is wholeheartedly committed to fighting for Human Rights. In 2019, he will take part for the first time in the Ukrainian LGBT choir festival in Odesa with Munich’s “Philhomoniker”, a gay choir. Olena is a woman with ideas, brave and political, with a talent for organisation and PR. She was once responsible for the press work for KyivPride and is also a board member of Liga, the Nikolaev organisation concerned with LGBT-issues for so many years now. Olena is actually a doctor but nowadays she earns a living in the IT and as coach for kettlebells. Kettlebells were during Soviet times particuarly popular in the East and nowadays in the West, too. The sport brings her the balance that she needs when again she’s annoyed with the situation in her country. She loves to travel, with her wife she is always flying all around the world. Olena does a lot of PR work for the contact group and she always has many ideas for new common projects. 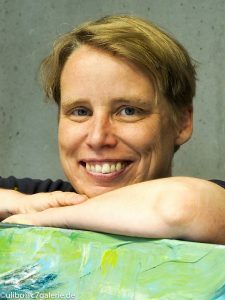 Sibylle along with many other women, every year, could spend months organising the “Lesbenkulturtage”, a cultural event week especially for lesbian women. This also gives the chance for activists from Ukraine to take part. Since 2016, she’s speaking for Munich Kyiv Queer, too, a group she has co-founded. 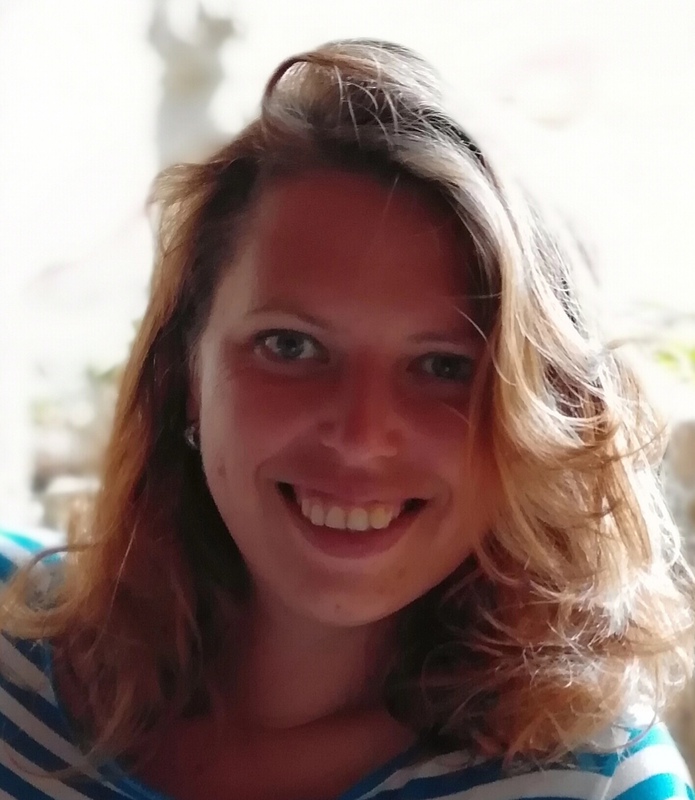 Having studied Slavic cultures, Sibylle is happy about the Kyiv project of the Munich LGBT-community. She long argues against injustices and she can be tough. She knows that in the contact group it is not just about one side helping the other. Both sides can learn from each other. Sibylle brings not just her language skills, but her organisational talent. Eastern Europe has always fascinated her. Yuri Yourski strongly believes in team work. 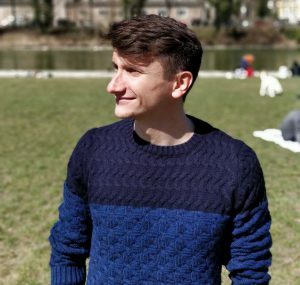 That is why he joined Munich Kyiv Queer right after having been part in one of our yearly volunteers’ workshop weeks we offer in Munich for Ukrainian LGBT-activists. For years he worked as a Human Rights defender among Gay Alliance Ukraine, one of the biggest LGBT-organisations in the country. Now he is living in Estonia to fight for the Eurasian Coalition on Male Health in Tallinn. The political situation in Ukraine has prompted him to action and gives him much hope for positive future changes. Yuri grew up in the city of Zaporizhzhia. He is specialised in developing anti-discrimination campaigns, knows the importance of sexual education among youth and eagerly studies how education and art may help to combat intolerance in the future.